I've got recipes to share, friends--comforting, colorful, wholesome recipes that are easy and fun to make. But they can wait for just a day or two. I've been meaning to write up a delicious experience we delighted in several weeks ago, as well as a valuable resource around which it all pivots. I guess both the personal opportunity and the resource appropriately deserve the same name: Adventures in Veggieland. I first met nationally renowned feeding therapist, author, and speech pathologist Melanie Potock about two years ago. My friend Kat kindly facilitated the introduction so that I could write about her for LiveWell Longmont. Once you get past a little natural intimidation in meeting the tall, poised, polished, extremely accomplished and talented person who seems a natural fit to host her own TV show, it's impossible not to be drawn in by Melanie's devoted, generous passion. What's more, once you get talking, guaranteed she'll even make you feel good about your wonderful, creative ideas...and you will know she's being genuine. 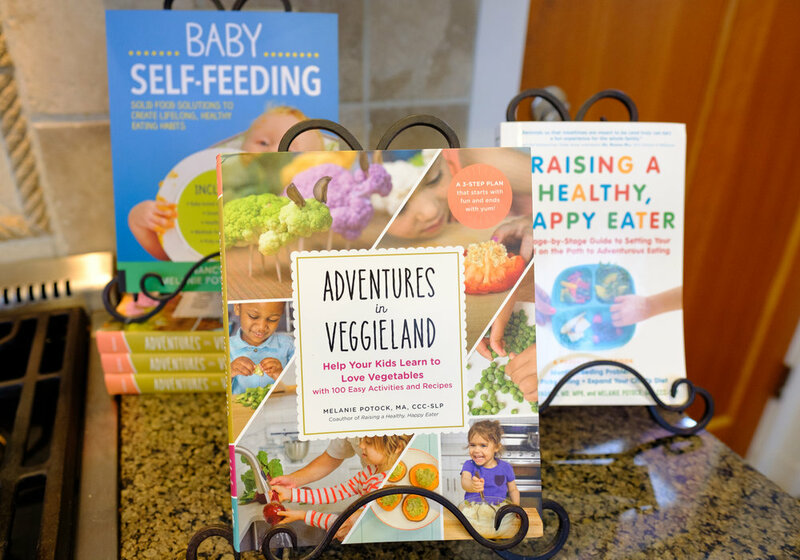 Currently, Melanie is developing an online curriculum for parents who are looking for guidance in their kids' nutritional development. As part of this, she has been creating instructive videos. For one of these, she needed some Kid Chefs, and both Chef F and Kat's daughter Annabelle were invited! Lucky us!! It was a cold, snowy day when we filmed, the roadsides steep in slush. But the falling flakes were fluffy, swirling and beautiful, and only added to the excitement of the day, more than they slowed its progress. The kids were amazing. Chef F was focused, taking his role on board with the greatest seriousness (though he galloped around Coach Mel's impeccable, perfect kitchen like a wild stallion pre-video). Chef Annabelle demonstrated "Expose" as she played with Wizard of Oz figurines down a mashed potato road. Chef Felix demonstrated "Explore", thoughtfully selecting toppings for a baked sweet potato. I think back to the very early days of parenting, when doctors would gently advise and reassure, it takes roughly 15 exposures for a child to truly like a food. Exposure is indeed so important, in everything in life. But think about how important the type of exposure that exposure is. Doesn't it take, say, 25 compliments to undo an insult or dull the sting? Doesn't it go a long way in encouraging positive responses if exposures are playful?